We’ve been covering the 2018 Dodge Challenger SRT Demon a crapload here, like every car-freak website out there: how crazy fast it is, why it’s banned by the NHRA, why it makes people soil their underbits, and on and on and on. Enough already, right? Wrong. There’s one big question no one has answered: exactly what demon is the Dodge Demon demon? Yeah, that’s right, I asked the question. The question that’s right in front of everyone’s face. The Dodge Challenger SRT Demon must be referring to a specific demon, of which there are plenty. 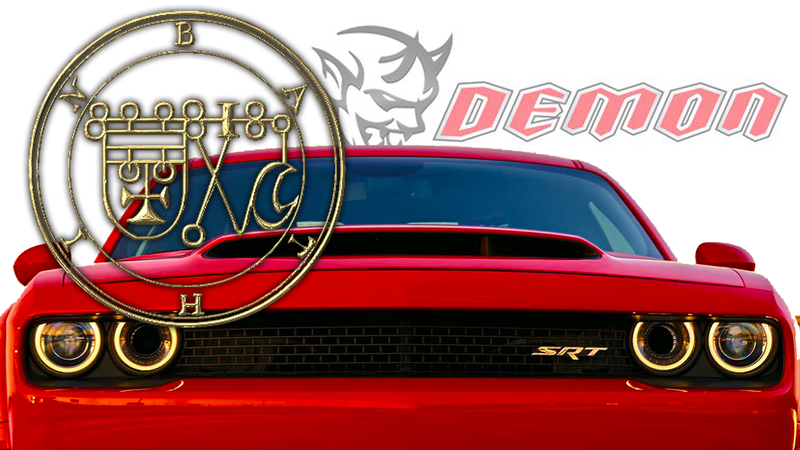 They didn’t name it the Dodge Challenger SRT Satan, after all, probably because that didn’t focus group well with people who prefer Jesus or whoever to the Prince of Lies. So, out of the whole vast panoply of Demonology, there must be at least one demon with traits that at least somewhat match the key traits of the car. I think I found that demon. The Eighteenth Spirit is Bathin. He is a Mighty and Strong Duke, and appeareth like a Strong Man with the tail of a Serpent, sitting upon a pale-coloured [Horse?]. 1 He knoweth the Virtues of Herbs and Precious Sontes, and can transport men suddenly from one country to another. He ruleth over 30 Legions of Spirits. His Seal is this which is to be worn as aforesaid. The key part here is “can transport men suddenly from one country to another,” which is, of course, basically a description of speed. Transporting people suddenly from one place to another is pretty much what speed’s all about, right? Plus, that tail of a Serpent business probably refers to the Demon’s familial relation, the SRT Viper, and I wouldn’t be surprised if a lot of the Demon’s target market knoweth the Virtues of Herbs, if you get my drift. But yeah, now we know: that demon on the Challenger SRT Demon has a name. The name is Bathin. If you’re so inclined, feel free to hail Bathin, Mighty and Strong Duke on a pale horse, demon of speed.